This video continues to be one of the most watched things on this blog, so I thought I'd repost it for anyone that may not have seen it yet. The discussion begins at about the 3:32 mark. From January of this year. Thanks to Will for passing this along. The declining ability of important governments to attenuate economic stress will affect the capital markets for years to come. Risky assets' valuations will be affected accordingly. Halting the downward maelstrom is what current monetary policy is attempting to accomplish. With fiscal policy in most developed countries incredibly restrictive instead of stimulative, central banks have assumed the helm on their own – but it has been a long and relatively futile watch. Structural growth problems in developed economies cannot be solved by a magic penny or a magic trillion dollar bill, for that matter. If (1) globalization is precluding the hiring of domestic labor due to cheaper alternatives in developing countries, then rock-bottom yields can do little to change the minds of corporate decision makers. If (2) technological innovation is destroying retail book and record stores, as well as theaters and retail shopping centers nationwide due to online retailers, then what do low cap rates matter to Macy’s or Walmart in terms of future store expansion? If (3) U.S. and Euroland boomers are beginning to retire or at least plan more seriously for retirement, why will lower interest rates cause them to spend more? As a matter of fact, savers will have to save more just to replicate their expected retirement income from bank CDs or Treasuries that used to yield 5% and now offer something close to nothing. My original question – “Can you solve a debt crisis by creating more debt?” – must continue to be answered in the negative, because that debt – low yielding as it is – is not creating growth. Instead, we are seeing: minimal job creation, historically low investment, consumption turning into savings and GDP growth at less than New Normal levels. The Rogoff/Reinhart biblical parallel of seven years of fat followed by seven years of lean is not likely to be disproven in this cycle. The only missing input to the equation would seem to be how many years of fat did we actually experience? More than seven, I would suggest. With respect to Europe's perceived "solution" to its debt crisis, the 50% write-down of Greek debt is appropriate (better than 21%, but probably still light), but it's not clear that this includes a writedown of Greek obligations to "official" holders such as other European governments and agencies. If not, it's unclear whether the writedown is really deep enough to allow Greece to avoid further debt problems several years out. Likewise, I suspect that investors are celebrating various "headline" figures (such as "1 trillion euros") without much understanding of what they are cheering about. 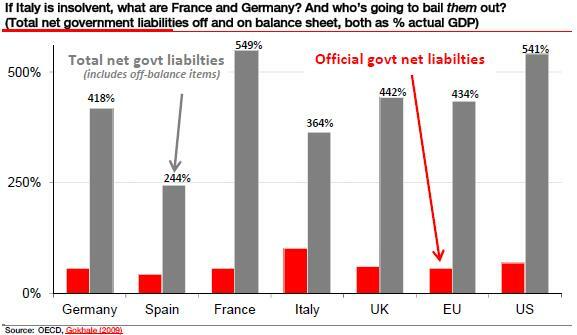 The European Financial Stability Facility (EFSF) is a Luxembourg corporation to which European states have committed 440 billion euros of backing, beyond which the EFSF must issue its own bonds to investors in order to make loans (not grants) to recipient countries or banks. There are two basic options that the EFSF contemplates for "leveraging" its 440 billion euros (which will actually probably be closer to 250 billion for all of Europe after amounts needed for Greece and bank recapitalizations). One is to issue "credit enhancements" or "partial protection certificates" that would be sold along with the new debt of European governments, where the certificates would provide first-loss protection of say, 20% of face value. Alternatively, the EFSF could construct a "special purpose vehicle" or SPV in each given country - basically an investment company formed to buy European debt - where the EFSF would "provide the equity tranche of the vehicle and hence absorb the first proportion of losses incurred by the vehicle." So to start with, the EFSF is not actually an operating "bailout fund" at present - it's a shell corporation with a business plan and a certain amount of promised capital - not yet in hand - from European governments, in search of additional funding from private investors. Its intended business is to a) partially insure European debt, using capital from European governments, which these governments will obtain by issuing debt to investors, or b) to purchase European debt outright, by issuing EFSF debt to investors, leveraging capital obtained from European governments, which these governments will obtain by issuing debt to investors. In effect, European leaders have announced "We have agreed to solve our debt problem, leveraging money we do not have, to create a fund, which will then borrow several times that amount, in order to buy enormous amounts of new debt that we will need to issue." Exactly what happened in Europe yesterday? The market reacted like it was the Second Coming of the Solution to End All Solutions. No problem here! The European debt crisis is solved! But if you look deeply (almost always dangerous when it comes to Europe) there is more to the market “melt-up” than simple euphoria and relief. What you find is a very disturbing unintended consequence that will come back to haunt us, as, sadly, I have written about in the past. The finger points to our old friends derivatives and credit default swaps. This week, as I recover from a rather nasty bug, we look at gamma and delta and other odd entities that may be behind the real reason for the market response, as we march inexorably toward the final chapters of the Endgame. Let’s see how far out on a limb I can go. Oct. 28 (Bloomberg) -- Jim Chanos, founder of hedge fund Kynikos Associates Ltd., talks about the outlook for China's economy and real estate market. 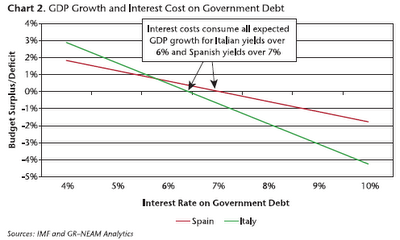 Chanos also discusses Europe's debt crisis. He speaks from Singapore with Susan Li on Bloomberg Television's "First Up." For part one, go HERE. "As I mentioned above, it is not natural for us to learn from history. We have enough clues to believe that our human endowment does not favor transfers of experience in a cultural way but through selection of those who bear some favorable traits. It is a platitude that children learn only from their own mistakes; they will cease to touch a burning stove only when they are themselves burned; no possible warning by others can lead to developing the smallest form of cautiousness. Adults, too, suffer from such a condition. In this white paper, Rich Mattione constructs a simple model that attempts to arithmetize the dynamics of sovereign debt and then applies several hypothetical scenarios specific to the European sovereign debt problem, concluding that the arithmetic of Europe's sovereign debt crisis is daunting, but not insuperable. You can search for old papers written by Newton, Darwin, Ben Franklin, etc. The Royal Society has today announced that its world-famous historical journal archive – which includes the first ever peer-reviewed scientific journal – has been made permanently free to access online. Around 60,000 historical scientific papers are accessible via a fully searchable online archive, with papers published more than 70 years ago now becoming freely available. "I think humility is essential, especially concerning the ability to know the future. Before acting on a forecast, we must ask whether there's good reason to think we're more right than the consensus view already embodied in prices. I think it's possible to get a knowledge advantage with regard to under-researched companies and securities, but only through hard work and skill." We are in the midst of a deleveraging, we are nearly out of ammunition and we are at each other’s throats. Being in a deleveraging and nearly out of ammunition is a very difficult position to be in. But, being at each other’s throats is our biggest problem. Our character and our political and social systems are now being tested in ways that have typically been tested in past deleveragings. In deleveragings bad economic conditions typically lead to emotional reactions, social and political fragmentation, poor decision-making and increased conflict. When this occurs in democracies, the checks and balance system, which is intended to yield the best decisions for the whole, can stand in the way of thoughtful leadership and lead to ineffective “mob” rule. This dynamic can lead to a self-reinforcing downward spiral. Frustrations increase, the established ways of doing things come under attack and frustrations over the ineffectiveness of government creates the perceived need for someone to gain control of the mess. Plato spoke of this dynamic. It was the reason Hitler was elected in 1933. In our opinion these types of risks are now emerging and should be taken into consideration when trying to figure out what may lie ahead. Rather than trying to resolve disagreements through thoughtful discourse, people are now trying to grab power to beat and suppress their opponents. Tensions between the rich and the poor, capitalists and socialists, those in and out of power and different factions in each group are now intensifying in a manner that is classic in deleveragings. Politicians who are fighting for power in a political year are fanning the flames and are increasingly willing to do risky things (like shutting down the government) in pursuit of their missions and popular support. This growing populism will have important implications for monetary, fiscal and trade policies and will significantly increase risks of a markets downturn and a global depression. Just a reminder that Steve Keen’s second edition of Debunking Economics was released in the U.S. today. I’m still slowly going through it, but I highly recommend the book and watching the corresponding LECTURES as well. Oct. 24 (Bloomberg) -- Charles Munger, vice chairman of Berkshire Hathaway Inc., talks with reporters about European leaders' handling of the region's debt crisis. Munger, speaking at BYD Co.'s North American headquarters in Los Angeles, also discusses Berkshire's investment in the Chinese automaker. If you’re interested to learn more, I highly recommendation searching through Simoleon Sense as Miguel has posted a bunch of great links on this topic. WENZHOU, China — The 300 employees of Aomi Fluid Equipment here were delighted recently when the owner offered an all-expenses-paid, two-day trip to a mountain resort three hours away. The owner, Sun Fucai — or Boss Sun, as he’s known — was so insistent that his workers attend that he imposed a $30 fine on any employee who refused the getaway. Nearly everyone went. The boss, as it turned out, was millions of dollars in debt to loan sharks — underground lenders of the sort that many private businesses in China routinely use because the government-run banks typically lend only to big state-run corporations. As China’s economy has begun to slow slightly, more and more entrepreneurs are finding themselves in Mr. Sun’s straits — unable to meet debt payments on which interest rates often run as high as 70 percent in this nation’s thriving unregulated, underground loan system. Such illegal lending amounts to about $630 billion a year, or the equivalent of about 10 percent of China’s gross domestic product, according to estimates by the investment bank UBS. Below are a few sections (slightly edited for public viewing) from a letter just sent to the investors of a fund I help manage. If you’re interested in receiving our letters, feel free to email either Matt or me at the email addresses listed HERE. We often interact with professionals who exercise their judgment with evident confidence, sometimes priding themselves on the power of their intuition. In a world rife with illusions of validity and skill, can we trust them? How do we distinguish the justified confidence of experts from the sincere overconfidence of professionals who do not know they are out of their depth? We can believe an expert who admits uncertainty but cannot take expressions of high confidence at face value. As I first learned on the obstacle field, people come up with coherent stories and confident predictions even when they know little or nothing. Overconfidence arises because people are often blind to their own blindness. True intuitive expertise is learned from prolonged experience with good feedback on mistakes. You are probably an expert in guessing your spouse’s mood from one word on the telephone; chess players find a strong move in a single glance at a complex position; and true legends of instant diagnoses are common among physicians. To know whether you can trust a particular intuitive judgment, there are two questions you should ask: Is the environment in which the judgment is made sufficiently regular to enable predictions from the available evidence? The answer is yes for diagnosticians, no for stock pickers. Do the professionals have an adequate opportunity to learn the cues and the regularities? The answer here depends on the professionals’ experience and on the quality and speed with which they discover their mistakes. Anesthesiologists have a better chance to develop intuitions than radiologists do. Many of the professionals we encounter easily pass both tests, and their off-the-cuff judgments deserve to be taken seriously. In general, however, you should not take assertive and confident people at their own evaluation unless you have independent reason to believe that they know what they are talking about. Unfortunately, this advice is difficult to follow: overconfident professionals sincerely believe they have expertise, act as experts and look like experts. You will have to struggle to remind yourself that they may be in the grip of an illusion. Oct. 18 (Bloomberg) -- Nassim Taleb, author of "The Black Swan" and a New York University professor, discusses the "Occupy Wall Street" protest and his view of the global banking system. Taleb, speaking with Erik Schatzker on Bloomberg Television's "InsideTrack," also discusses the need to apply the principles of "Hammurabi's Code" to the banking system. Among the effects of the recent and now renewed credit strains in the global economy is that investors have lost touch with relative magnitudes. For example, a billion dollars effectively represents about $3.20 for every adult and child in the U.S., while a trillion dollars represents about $3,200 dollars per person. From our standpoint, among the most important research coordination that government provides comes from the National Institutes of Health (NIH), which funds basic medical research in cancer, diabetes, multiple sclerosis, Alzheimer's, autism, and other conditions, and where the total annual budget is about $31 billion annually (roughly $1,000 per American). Add in just over $7 billion in research through the National Science Foundation, and about $1,200 per citizen a year is spent by the government on essential medical and non-military scientific research through these agencies. These figures pale in comparison to the amounts that are increasingly demanded in order to make bondholders whole on their voluntary, bad investments. The Federal Reserve provided an amount equal to the entire NIH budget simply to backstop the rescue of Bear Stearns, which allowed Bear Stearns bondholders to receive 100 cents on the dollar, plus interest. In return, the Fed got questionable assets that it pouched into a shell company called "Maiden Lane," which were later reported to have "underperformed." Incomprehensibly large bailout figures now get tossed around unexamined in the wake of the 2008-2009 crisis (blessed, of course, by Wall Street), while funding toward NIH, NSF and other essential purposes has been increasingly squeezed. At the urging of Treasury Secretary Timothy Geithner, Europe has been encouraged to follow the "big bazooka" approach to the banking system. That global fiscal policy is forced into austere spending cuts for research, education, and social services as a result of financial recklessness, but we've become conditioned not to blink, much less wince, at gargantuan bailout figures to defend the bloated financial institutions that made bad investments at 20- 30- and 40-to-1 leverage, is Timothy Geithner's triumph and humanity's collective loss. The most depressing display of math-illiteracy by investors last week was the excitement over a report suggesting that France and Germany had agreed to a 2 trillion euro bailout package for Europe, which triggered a "risk-on" tone for the rest of the week, even after the report was retracted as inaccurate. It was almost beyond belief that investors took that report seriously, but people have become so tolerant of unbelievably large figures that virtually any bailout number can now be tossed out without triggering the least bit of scrutiny. Notably, 2 trillion euros is more than the GDP of France, and is half the GDP of Germany and France combined. Moreover, Europe has just gone through a tooth-pulling process just to approve 440 billion euros for the European Financial Stability Fund (EFSF) from all EU members combined. His products - the Mac, iPhone, iPad and others - forever changed the way we think about technology. But how should we think about the man behind them, Apple's hard-driving co-founder Steve Jobs? In the years before his death, Jobs granted biographer Walter Isaacson more than 40 interviews, many recorded on tape. The result, as Steve Kroft reveals in this two-part story, is a rich portrait of an extraordinary innovator, whose outsized talents were matched by very human limitations. Thanks to Will for passing this article along. The once highflying mutual fund is down sharply this year, and one of its top executives has abruptly left the firm. Is there a connection? Bruce R. Berkowitz had plenty of admirers while his Fairholme Fund was tripling investors' money over the past decade. Financial publications like this one encouraged readers to put their savings into the hands of the now 53-year-old value investor who affects the plain-spoken ways of Warren Buffett and beat the market by an average of 14% in each of the past 10 years. But this year, the mutual fund (ticker: FAIRX) is down 27%, while the broad market has been roughly flat. Suddenly, Berkowitz has plenty of doubters. Redemptions and negative returns have cut Fairholme's assets in half since last year, to about $9 billion. Folks with firsthand knowledge of Berkowitz wonder if the brilliant investor—whom Morningstar last year dubbed Manager of the Decade for his U.S. stockpicking–has lost his way. Says a Wall Streeter familiar with Berkowitz: "The way he's making money—and who he's doing it with—is not how the 10-year track record was created." As for "who," that would be Charles M. Fernandez, whom Berkowitz abruptly made director, president and co-manager of Fairholme in 2008. Fairholme's long-time team of portfolio professionals were effectively displaced by the now 49-year-old Fernandez, who had no apparent experience in investment management. Berkowitz even installed Fernandez in the mansion next door to his own, in the tony Tahiti Beach Island enclave of Coral Gables, Fla., and then forgave Fernandez's $9 million mortgage. But something seems to have changed in their relationship. Thanks to Andrew for mentioning this episode. My colleague, Matt Miller, did a write-up on one of our newer positions for Value Investors Club. The company is EGI Financial Holdings, Inc. (EFH.TO) and the write-up is now available for public viewing. Disclosure: Matthew Miller is a portfolio manager at Chanticleer Advisors and the fund Chanticleer manages owns shares in EGI Financial Holdings, Inc. It may in the future buy or sell shares and it is under no obligation to update its activities. This is not a recommendation to buy or sell a security. Please do your own research before making an investment decision. Matt Miller Interview and Eastern Insurance Holdings, Inc. The outlook, however, seems much trickier now. Too many western economies, having hurled taxpayers' money indiscriminately at the banks without allowing normal bankruptcies and restructuring, have catapulted themselves into a debt trap from which it is hard to see any satisfactory exit route. Debt dynamics alone would now make a return to sustainable growth difficult; resource constraints and rising ecological costs compound the problem. Complacency on Asia's prospects seems misplaced. The region remains as export-dependent as ever. Hopes that weakness in US & European demand can be offset by growth in emerging market consumption seem implausible; and after the greatest stimulus money could buy, it is hard to see what China could do for an encore. Asia-ex-Japan may not have the sovereign debt and social security problems of the west, but the region is not debt-problem-free, and may not be able to maintain the levels of growth to which it has become accustomed. Asian equities are now priced to discount cyclical squalls; they are not priced for an ex-growth global economy. Stock selection is therefore complicated, as we envisage poor secular prospects for a number of formerly strong industries, and relatively subdued growth for others which are priced for perfection. We urge all our investors to reassess their asset allocation, and in particular any assumptions about Asian growth which may have been forged in a different era. The export machine faces headwinds which may be secular, not cyclical. Energy self-sufficiency has given way to constraints, and to growing shortages. Pollution is becoming a huge problem. Climate change is becoming expensive. (Some of our companies suffered in the recent Thai floods.) Destruction of the commons over the last thirty years has been monumental. Mangroves are gone, rainforests are gone, coral has gone, fish are gone: natural resources which seemed infinite have shrunk to tiny, endangered fractions in the space of three decades. The exploitation of these may have boosted GDP in past decades. Replacement activities such as fish farming may boost GDP in the future - but the easy stages of development are in many places behind us, and stored problems are mounting. Despite all this, Asian equities still seem to us a reasonable place to try to preserve real purchasing power - but this is a different proposition from that of the past. John Mauldin: Can “It” Happen Here? “Peter Bernholz wrote the bible on inflation and hyperinflation, called Monetary Regimes and Inflation: History, Economic and Political Relationships. He writes about 29 periods of hyperinflation. What causes such a spectacular increase in prices? Bernholz has explained the process very elegantly. 2. Paper money standards with central banks independent of political authorities are less inflation-based than those with dependent central banks. 3. Currencies based on discretionary paper standards and bound by a regime of a fixed exchange rate to currencies, which either enjoy a metallic standard or, with a discretionary paper money standard, an independent central bank, show also a smaller tendency towards inflation, whether their central banks are independent or not. “Bernholz examined twelve of the twenty-nine hyperinflationary episodes where significant data existed. Every hyperinflation looked the same. ‘Hyperinflations are always caused by public budget deficits which are largely financed by money creation.’ But even more interestingly, Bernholz identified the level at which hyperinflations can start. He concluded that ‘the figures demonstrate clearly that deficits amounting to 40 percent or more of expenditures cannot be maintained. They lead to high inflation and hyperinflations….’ Interestingly, even lower levels of government deficits can cause inflation. For example, 20% deficits were behind all but four cases of hyperinflation. Oct. 10 (Bloomberg) -- Billionaire investor George Soros talks about global financial markets and his philanthropy. He speaks with Francine Lacqua on Bloomberg Television's "Eye To Eye." Why do you think it is so important to find out about prehistoric men and women? How can it help us? Well, simply to contextualise our place in nature. This is something that is of universal interest. Every culture studied by anthropologists has its own mythology of how people came about. These range from Australian aboriginal accounts to people in the Arctic, to people in the Middle East. The differences among these different myths are very great, of course, because they are all just myth. If we really want to find out where we came from, there is only one way that we can do that, and that is through the science of palaeontology. And so that is why we go out and try to get the evidence and pull that evidence together to understand what truly happened in our history and prehistory. Then last weekend, 86 days after getting its clean bill of health, Dexia took a government bailout to avoid collapsing. Nobody was surprised this happened. Nor should anyone have been. The stress-test exercise was a charade, just as it was a year earlier when Bank of Ireland Plc and Allied Irish Banks Plc passed their tests and collapsed soon after. Once again the rules were rigged so only a handful of unimportant banks would flunk. Everyone who was paying attention understood this. The European Union’s banking authority went through with the farce anyway, presumably aware that in all likelihood some big bank was bound to get a passing grade and quickly implode, the same as last year, causing embarrassment for everyone involved. All of which leads to the important question: Why? Why would any self-respecting regulator participate in this sort of reputational suicide? Is the problem mass corruption? Is it mass stupidity? Assuming it’s both, where on the stupidity- corruption continuum does one begin and the other end? Whatever the case, the European Banking Authority is making even U.S. regulators look good. That’s no small feat. Last week, the financial markets mounted a striking shift back to the "risk-on" trade, as investor concerns about a recession were abandoned, and Wall Street came to believe that Europe will easily contain its banking problems. Accordingly, downside protection was largely discarded (as reflected by a plunge in the CBOE volatility index), price-volume action reflected heavy short-covering short sales, investor interest shifted strongly away from defensive sectors to speculative ones. For defensive investors, it was admittedly a difficult week, as the markets suddenly became convinced that no defense was needed, and treated defensive investments accordingly. From my perspective, Wall Street's "relief" about the economy, and its willingness to set aside recession concerns, is a mistake born of confusion between leading indicators and lagging ones. Leading evidence is not only clear, but on a statistical basis is essentially certain that the U.S. economy, and indeed, the global economy, faces an oncoming recession. As Lakshman Achuthan notes on the basis of ECRI's own (and historically reliable) set of indicators, "We've entered a vicious cycle, and it's too late: a recession can't be averted." Likewise, lagging evidence is largely clear that the economy was not yet in a recession as of, say, August or September. The error that investors are inviting here is to treat lagging indicators as if they are leading ones. The simple fact is that the measures that we use to identify recession risk tend to operate with a lead of a few months. Those few months are often critical, in the sense that the markets can often suffer deep and abrupt losses before coincident and lagging evidence demonstrates actual economic weakness. As a result, there is sometimes a "denial" phase between the point where the leading evidence locks onto a recession track, and the point where the coincident evidence confirms it. We saw exactly that sort of pattern prior to the last recession. While the recession evidence was in by November 2007 (see Expecting A Recession ), the economy enjoyed two additional months of payroll job growth, and new claims for unemployment trended higher in a choppy and indecisive way until well into 2008. Even after Bear Stearns failed in March 2008, the market briefly staged a rally that put it within about 10% of its bull market high. At present, the S&P 500 is again just 10% below the high it set before the recent market downturn began. In my view, the likelihood is very thin that the economy will avoid a recession, that Greece will avoid default, or that Europe will deal seamlessly with the financial strains of a banking system that is more than twice as leveraged as the U.S. banking system was before the 2008-2009 crisis. After reading a write-up on DreamWorks Animation (HERE), I watched Jeffrey Katzenberg's appearance on Charlie Rose from last year. It is a great interview, whether or not you have any interest in the stock. It’s hard to imagine a better subject than the life and times of Steve Jobs—charismatic and difficult, mysterious and inspiring, with a biography that might have been plucked from Greek myth. In the wake of his death Wired presents Steve Jobs: Revolutionary, an eBook featuring our best stories about him. The anthology begins with a remembrance by Wired senior writer Steven Levy, who interviewed Jobs many times over the last two decades. We continue with six other stories that track Jobs on his uncanny rise, his dramatic fall, and his spectacular, unlikely return to Apple. Steve Jobs: Revolutionary is available through the Wired app in the iTunes Store. Free to subscribers; single copy, $2.99. Steve Jobs: Revolutionary is also available in the Kindle Store, for $2.99, and for the Barnes & Noble Nook, also for $2.99. I’ve posted quite a few things from Art De Vany, and when talking about muscle mass and aging he basically says that if you age, you don't lose muscle mass, it is the opposite: if you lose muscle mass, you age; and when you lose it all, you die. It looks like Mark Sisson has also touched on this topic HERE. The upside is you live a ridiculously long and healthy life, can’t develop cancer, feel very little pain, never get lonely and have great skin right to the end. How this collection of traits and behaviors came to exist in a strange rodent found only in the Horn of Africa has been a mystery. Now biologists have a tool for unraveling it — and what they find may one day prove useful to human medicine. A team of 36 scientists working on three continents published the genome Wednesday of the naked mole rat, the latest and perhaps most exotic organism to have its entire DNA sequence transcribed. “It’s a treasure-trove for cancer and Alzheimer’s research. It’s got so much information that we can now go and mine to test all kinds of theories about aging and disease,” said Rochelle Buffenstein, a researcher at the University of Texas Health Science Center in San Antonio who participated in the project. “Having the genome raises the possibility of finding treatments that may prevent cancer in people and possibly even extend life span,” said Vera Gorbunova, a cell biologist and mole rat researcher at the University of Rochester, who was not involved in the work. “You can have virtually anything you want, but you can’t have everything you want. The first, most important, and typically most difficult step in the 5-Step Process is setting goals, because it forces you to decide what you really want and therefore what you can possibly get out of life. This is the step where you face the fundamental limit: life is like a giant smorgasbord of more delicious alternatives than you can ever hope to taste. So you have to reject having some things you want in order to get other things you want more. Some people fail at this point, afraid to reject a good alternative for fear that the loss will deprive them of some essential ingredient to their personal happiness. As a result, they pursue too many goals at the same time, achieving few or none of them. In other words, you can have an enormous amount: much, much more than what you need to have for a happy life. So don’t get discouraged by not being able to have everything you want, and for God’s sake, don’t be paralyzed by the choices. That’s nonsensical and unproductive. Get on with making your choices. It is -- and this is putting it mildly -- sometimes difficult to generalize about a nation of 1.3 billion people. But let's go out on a limb and say there aren't many who would quibble with the description of China as money-obsessed. This is a nation in which arguably the most important phrase ever attributed to its transformational leader, Deng Xiaoping, was "to get rich is glorious." In China they call Warren Buffett the "god of stocks," and whenever he visits, the Chinese media cover his every move and utterance. There have been over 40 books about Warren Buffett translated into Chinese. Which makes it very interesting that Peter Buffett, Warren's unassuming 53-year-old son, has recently become a rising star in China in his own right. And it's not because everyone thinks Warren's investment acumen has been handed down via DNA. Peter Buffett is a successful musician and a composer, writing scores for television and film (the Dances With Wolves soundtrack is one of his prominent credits) and performing his New Agey music in concert. He played most recently in August at Beijing Tanglewood, a gorgeous new outdoor concert space in the shadow of the Great Wall. But Beijing isn't exactly Marin County. In today's China, New Age music will take you only so far. The reason Buffett has piqued the interest of a lot of Chinese -- students and young professionals in particular -- is that he has taken to dispensing life advice along with his music. And if part of his core message -- in essence, that money isn't everything -- seems rather counterintuitive in China these days, that's precisely the reason he has struck a chord. Warren Buffett's rock-star status tells us something about what China is today; Peter's success might tell us something about where it's going. GR-NEAM Reflections: 10/04/2011 - J.M.K., R.I.P.